With just over 12,000 MW installed capacity in Texas, the new peak in generation represents almost 86 percent of potential generation. Wind power is performing exactly as it is designed to do: it produces power when the wind blows. Critics scoff at wind power, saying it is unreliable and too costly because conventional generating plants must be built to carry the load when wind cannot. That argument has no validity, because one cannot expect windturbines as presently designed and installed to serve as baseload or load-following generating systems. At present, windturbines perform exactly as designed. An analogy would be expecting a delivery truck to perform like a race car and win a Formula One race. No rational people would ever expect a heavy delivery truck to win such a race. The truck was designed for a completely different purpose. How then, can windturbines be expected to provide baseload or load-following capability? Wind power will someday provide such power, but only when cost-effective, grid-scale energy storage is available. Over time, wind energy economics will continue to decrease the cost to generate from wind, as economies of scale and economy from mass production continue to reduce costs. Also, as more transmission lines are built, the economics of wind energy improve. At some point very soon, the full production costs of wind energy (capital plus operating charges) will be low enough to begin justifying the high costs of grid-scale energy storage. When the combined cost of wind energy generation plus grid-scale energy storage reach parity with conventional generation, the real boom in wind energy will begin. Grid-scale storage will allow power produced from windturbines to be stored as the power is generated, typically at night for on-shore systems. Night power prices are usually low, so windturbine operators would prefer not to sell the power at night. However, the next day, power prices increase. The storage system will then release the stored power in a controlled manner, producing reliable, even load-following, power into the grid at high on-peak prices. The drawback is that some energy is lost in the storage and release steps. The overall economics will depend on the prices and energy losses. 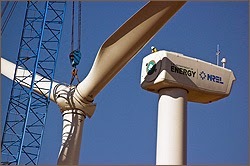 For now, the Texas windturbines are proving that wind energy is viable, wind energy works as designed.